Later today, boxing enthusiast all over the world will be in unison as they witness yet another great battle in the history of boxing. 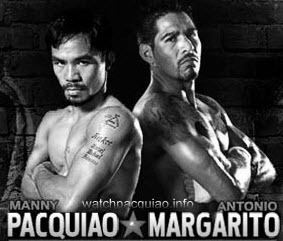 Number one pound-for-pound best fighter in the world and now Sarangani Province representative Manny Pacquiao is set to fight former three-time Welterweight champion Mexican-American Antonio Margarito at the famous Dallas Cowboys Stadium. A scheduled 12-round of non-stop and exciting action is what two fighters promised as they both aiming the vacant World Boxing Council (WBC) Junior Middleweight title. Each camp claimed victory as they will knock-out each other as both had enough practiced and being conditioned for the fight. Early psychic predictions said that Manny Pacquiao will emerge victorious but will go thick and thin and will having hard time fighting Margarito. Manny Pacquiao is back at the Dallas Cowboys Stadium after his last year unanimous win to Joshua Clottey. Manny being known for his speed and being a power puncher is on a mission to get his eight world title in different division while Margarito is up for redemption and ofcourse for stopping Manny. A hard puncher himself, Margarito is an aggressive fighter who likes to attack and come forward to his opponent. Good luck to both fighter and thanks for giving us great and action pack viewing pleasure. hello.. first time to visit here.. i hope u can visit me too.. Thanks, for dropping caloy and reyapot. I have visited your blog and put some comment too.